This is a quick tutorial on how to deploy your own DNS service easily through Docker. 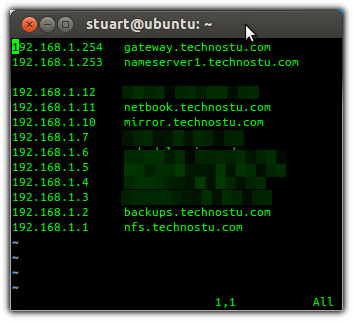 Having a DNS server is an extremely good idea if you are a Linux enthusiast or a developer. It's much easier to remember names than IP's and having one location that maps all the IPs to hostnames is extremely useful. Because it is deployed through docker, you can use the Linux OS of your choice. Create a directory called dnsmasq.hosts in your home folder. 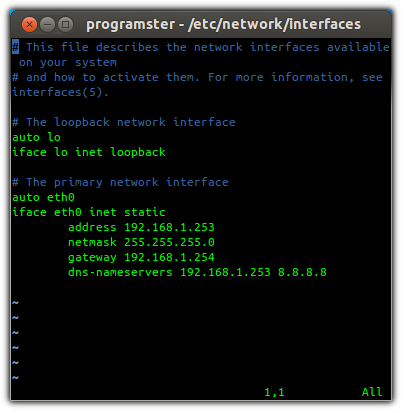 Update the hosts /etc/network/interfaces file so that dns-nameservers option points to the hosts own public IP that it wants to answer requests on. It is a good idea to put in a secondary normal DNS as well for when your new DNS service is not running. I used to use the sroegner/dnsmasq image, but that wasn't being maintained so I have built my own and configured it automatically update the repository daily. Thats it! You now have an incredibly basic DNS "server" setup to answer requests. If you're doing this on a local home network, chances are that your router is set to provide your computers with dynamic IP's and nameservers. Even if you set a static IP, your server will still grab the nameserver. This will result in your /etc/resolv.conf file having the router's specified nameserver first, which means that your server will not use the DNS system you just set up. Worse yet, this will reset every time the network restarts or you reboot the server. Alternatively, you could just update your router/dhcp provider's setting for the nameserver so that the correct nameserver automatically "spreads".